Home Increase Your Testosterone The Best Muscle Building Stack On The Market Right Now! Getting bigger is that much easier with the help of good old supplements! Unless you’ve been living under a rock, you’re most likely aware of the fact that dietary and sports supplements have taken the world by storm. And logically, supplement stacks started to gain popularity as most fitness enthusiasts and men, in general, are wondering what the best muscle building stack on the market is at the moment. There’s a good reason for the ever increasing demand for such products and why more and more guys are turning to natural and legal alternatives for optimizing testosterone levels, building quality muscle and even shedding body fat. Unlike the potentially dangerous anabolic steroids, dietary supplements are regulated by the US Food and drug administration (FDA). So, fasten your seatbelts because today’s post will be all about the most optimal stack for packing on muscle… and more! What’s The Best Supplement Stack For Muscle Gain In 2018? Apart from (obviously) working out in order to build muscle, you can utilize each of these awesome supplements and get maximum results thanks to their synergistic muscle building effect when taken as a stack. Note that the supplements listed below are only the most essential ones (in my opinion) for getting bigger – you don’t need a dozen products or something too fancy for that! Proteins are arguably the most important aspect of building muscle since they’re a vital nutrient in our bodies and it’s the building block of not only muscle tissue but tissue in general. Now, when it comes to the most optimal protein source for getting more muscular a blend of different protein sources is your best bet. That’s because the different protein sources have different absorption rates, e.g. whey protein – fast, milk protein – moderate, caseinate – slow etc. According to relevant studies, dairy proteins have a bigger impact on protein synthesis, which is essential for packing on muscle (1). 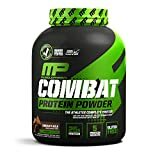 And if you’re wondering what the #1 best seller in the protein powder blend category on Amazon is, it’s MusclePharm’s Combat Protein Powder. This is a modern and sophisticated protein matrix of a whey protein blend (from concentrate, isolate and hydrolysate), micellar casein and egg albumin. There are even other added goodies such as digestive enzymes that should alleviate lactose-related issues as long as BCAAs and L-Glutamine for an ever greater anabolic effect on your muscles. With 25 grams of protein and only 130 calories per dose, you can clearly see why it’s a best seller. Oh, it tastes awesome as well, at least the chocolate milk flavor that I’ve tried already! So, by taking advantage of the absorption speed of each kind of protein, you’ll be feeding your muscles with protein for an extended period of time. Trust me, in the long run, this should yield better results as protein blends also make for great pre-bedtime shakes! Creatine has got to be one of the most sought-after bodybuilding and fitness supplements ever. This organic compound is naturally produced in our bodies as it’s created from two amino acids – Glycine and Arginine. However, the body produces only about 1 to 2 grams of Creatine per day which is far from optimal. Studies show that a typical loading phase with Creatine Monohydrate requires you to take 20-25 grams of Creatine for 5 days, followed by a maintenance period (lasting for the duration of the cycle) during which you’ll be taking 3-5 grams (2). Now that you know how much Creatine is enough to ensure adequate muscle saturation, it’s worth mentioning that researchers have found that this organic compound DOES have a positive effect on body composition (3). Or in other words, this supplement can most definitely help you get bigger i.e. build more lean mass. 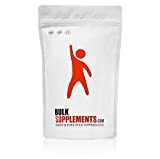 And if you’re mind-boggled by the huge amount of Creatine brands and products out there, then let me make your life easier – with a user rating of 4.8/5 stars (from a whopping over 10k reviews) and voted Amazon’s choice in its category, this is BulkSupplements’ Creatine Monohydrate Powder BulkSupplements Creatine Monohydrate Powder that uses the micronized version of Creatine. When you look at the label of this product, you quickly realize why it has such a stellar reputation. With 400 servings per container (1 kg), you’ll by supplying yourself with enough Creatine for the end of the world! Just a friendly reminder though – you can increase the absorption of Creatine Monohydrate by taking it with some fast-acting carbs like a teaspoon of honey or a banana. High-glycemic carbohydrates spike insulin levels, helping to flood your muscles with Creatine. Getting more buff and testosterone go hand in hand. To put it short, the testosterone you have coursing through your system, the more masculine you’ll be in every aspect, including physically i.e. more muscles, less body fat etc. And when it comes to top-rated T boosters, it’s hard to top the beloved Evl Test. Listed under ‘Amazon’s Choice’ category and with a 4.3/5-star rating (from over 1.3k user reviews), this is the go-to supplement for naturally optimizing your primary male hormone levels. It contains plenty of tested and proven ingredients such as Fenugreek that’s been scientifically validated to improve upper and lower body strength (4). Unfortunately, this supplement contains Tribulus, which is a herb that doesn’t have much use when it comes to testosterone. In fact, Tribulus might only be good as an aphrodisiac, but it won’t boost your T levels. Read Buyer Reviews On Amazon! 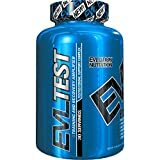 Anyway, the overall efficacy of EVL Test’s formula will more than make up for that, especially when you consider the vast amounts of happy customers this product has. Adding a pre-workout product to your muscle building arsenal is essential if you’re serious about packing on quality muscle. Pre-workout supplements are brilliant because they give you more energy, focus and strength. All of these are crucial elements for building muscle mass and especially if you’re training early in the morning or even after a grueling day at work/school/etc. – just watch out for the caffeine (and other stimulants) content as they might mess up with your sleep if you train later in the day. 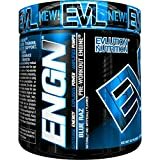 And once again, Amazon’s choice here is a very highly-rated product courtesy of Evlution Nutrition – EVL ENGN. This particular product is designed to give more oomph to your workouts by giving you more power, energy and focus. The good news is that researchers claim that using pre-workout supplements will give you more energy, better concentration, improved focus and reduced fatigue (5). All of this is exactly what you need in order to have a kickass workout that’ll properly stimulate your muscles. In essence, if your training sessions are more effective (e.g. you have more power), you’ll be able to lift heavier with more intensity. This would mean that you’re giving more than enough reason for your muscles to grow bigger and stronger! Compound exercises like squats can also help you pack on muscle fast! Okay, But What Supplements To Take To Get Big Fast? Anything else is completely optional and you’d be better off spending the money on food and a gym membership instead. Speaking of which, I hope that you do realize that supplements DO NOT replace a sound diet and training plan, right? Even if you’re taking the most cutting-edge and effective products, you won’t gain an ounce of muscle if your diet and workouts are sub-par. And above all, don’t forget to avoid the horrible testosterone-lowering foods! Is Creatine Actually Good For You? According to relevant studies – yes, it is. Contrary to popular myths and legends and what many believe, there are reports suggesting that taking Creatine may even offer protective effects regarding certain neurological, heat and even muscle diseases (6). The same data highlights the fact that by monitoring the effects of Creatine supplementation on young athletes for 4 weeks, researchers didn’t find any markets of disruption in neither urea production, nor serum enzymes. And on top of that, they couldn’t find any negative effects on the renal function of the test subjects. Of course, if you have an underlying condition related to your liver, kidneys or renal function, then, by all means, consult with your doctor. Certain studies suggest that guys who have a history of renal pathology (diseases) or individuals who’re using nephrotoxic prescription drugs have to be cautious when it comes to using Creatine since it can potentially alleviate the risk of developing renal dysfunction (7). Science is conclusive – if you want optimal results, take your Creatine immediately after a workout (8)! The same scientific evidence claims that taking this supplement right after you finish your training session is superior to taking it pre-workout in terms of becoming stronger and bigger. So, forget about all the broscience and the misconceptions that many ‘fitness guru’s spread that you have to basically take Creatine before, during, after or whatever. Taking it post-workout is the way to go and science agrees! Besides, most pre-workout supps these days have some form of Creatine in them so you’ll be most likely getting some Creatine before you hit the weights as well. Just make sure that you’re not taking too much of it since you don’t need more than 3 to 5 grams per day during the maintenance phase, as already mentioned. With the help of the best muscle building stack, doing pull ups will become a breeze. But What Exactly Is A Supplement Stack Though? It’s a carefully selected group of supplements that are designed to complement each other in order to provide the most optimal results. Arguably the biggest advantage of using stacks is the synergistic effect of the different supplements when two or more substances work together to produce greater results e.g. build muscle faster. Obviously, which one you go for depends entirely on your personal goals and what you’d like to achieve. If you are skinny and want to look bigger and more muscular, then you’ll choose a muscle building stack and if you’re overweight, then a fat burning stack is what you need. Lots of supplements to choose from, but only the most essential are useful ones are what you really need to get big! Utilizing the most efficient, proven and overall best muscle building stack on the market at the moment will inevitably take your gains to the next level. However, don’t forget that your diet and your exercise regime matter an awful lot, even more than what supplements you take. And if you’re wondering what kind of a workout plan to go for, feel free to check Arnold’s authentic training protocol that’s (logically) designed to optimize muscle hypertrophy (e.g. gains). Over to you now – what’s your favorite muscle building stack? Let me know in the comment section below! Previous articleDoes Nugenix Work – Or Is It All Smart Marketing?